Reliability projections for oxides requires more than just experimentation. After the experimentation is complete, the engineer must make a calculation as to the lifetime of the oxides on the component. Here is how the reliability engineer makes a projection. You need to know voltage, temperature, area scaling, and the distribution very accurately. In the graph shown here, the measured data is on the right. The measurement time might be in hours or tens of hours. The engineer will use a high voltage or electric field, possibly a high temperature and collect data. Hopefully, one can draw a straight line through the data, to define the voltage acceleration. This becomes the model. Then one must correct for area because the test structures have a much different area than the actual transistor gate dielectrics. This reduces the lifetime of the oxide substantially. Next, we need to account for the statistics of breakdown. 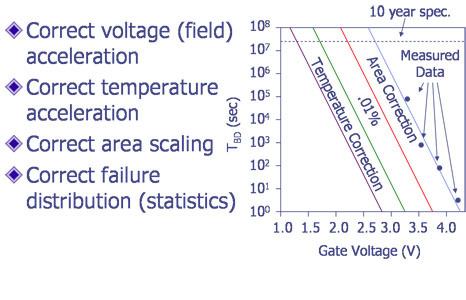 The time-to-failure of the individual gate dielectrics is dispersed. In a 10 million transistor IC, some dielectrics will fail before others. We need to account for the ones that might fail early. Also, we need to account for the fact that some ICs might fail before others do. Let's say we need to achieve a failure rate of less than 100 parts per million. This reduces the lifetime further. We also need to account for different operating temperatures. While the engineer might have tested at 25°C, the product may actually operate at 50 or 75°C. This reduces the lifetime even further. We then arrive at the correct extrapolation. Therefore, the area, distribution, temperature, and voltage acceleration must be accurate. These must be known quite accurately in order to give the customer a reasonable reliability projection number. Even so, the reliability projection number is inaccurate. Most IC manufacturers can provide about one significant digit accuracy. Semitracks, along with Semiconductor International, have put together a two-day course on Semiconductor Process Integration for CMOS and BiCMOS Technologies. Dr. Badih El-Kareh of Texas Instruments will give an overview of the process integration challenges associated with today's advanced semiconductor devices. Dr. El-Kareh will cover passive and active components, contact and interconnect issues, isolation technologies such as STI and SOI, transistor integration issues, as well as full CMOS, BiCMOS and High-Speed Bipolar Process Integration techniques.